Daniel Juncadella Pérez-Sala (born 7 May 1991) is a Spanish racecar driver that currently competes at the Deutsche Tourenwagen Masters. He is son of de Xavier Juncadella and nephew of Josep Maria Juncadella, Alex Soler-Roig and Luis Pérez-Sala, also racecar drivers. Juncadella began his motorsport career in karting in 2004, finishing 21st in the Copa Campeones Trophy Junior. He also finished 32nd in the Andrea Margutti Trophy ICA Junior class. Juncadella began his formula racing career in the 2007 Master Junior Formula season. He finished as runner-up in the championship, with seven wins and 359 points; losing out to Isaac Lopez by nine points. After six races at the end of the 2007 Formula BMW ADAC season, the following season, Juncadella competed in the new-for-2008 Formula BMW Europe series for EuroInternational. He finished fourth in the standings, taking thirteen points-scoring positions in sixteen races, including two wins at the Hungaroring. For 2009, Juncadella remained in the series, staying with EuroInternational. He finished as runner-up behind Brazilian team-mate Felipe Nasr in the championship with one win at Autodromo Nazionale Monza. Juncadella finished every race in the points, but was not enough to keep his backing from the Red Bull Junior Team. Juncadella competing at the second round of the 2010 Formula 3 Euro Series at Hockenheim. Juncadella has stepped up to the Formula 3 Euro Series for the 2010 season, joining Nicolas Marroc at Prema Powerteam, supported by professional road bicycle racing team Astana. At his first event at Circuit Paul Ricard, Juncadella took his first pole position before finishing fourth in the first race. For the 2013 season, Juncadella will race with Mercedes in the DTM. His best result so far is a win at Race 1 of the 2018 Brands Hatch Weekend. He tested with Williams F1 during the Young Drivers test at Silverstone, setting the fifth best time on the first day. On 24 January 2014, Juncadella joined Force India as a reserve driver. He attended all races and took part in Friday practice sessions. 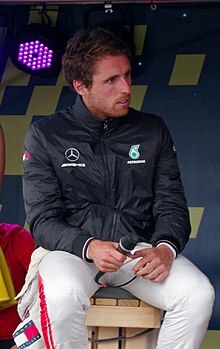 Juncadella list his hobbies as cross-country skiing, padel tennis, golf, music, going out, while his favourite circuit is Autodromo Nazionale Monza, where he won once during the 2009 Formula BMW Europe season. His favourite drivers are Mika Häkkinen and Michael Schumacher. He is the nephew of Luis Pérez-Sala, who drove for the Minardi Formula One team in 1988 and 1989 and was team principal of the Spanish HRT F1 in 2012. † Juncadella was a guest driver, so he was ineligible for points. † Driver retired, but was classified as he completed 75% of the winner's race distance. ^ Lehbrink, Ingo (3 August 2008). "Formula BMW Europe, 1- 3.8.08: Rounds 9 + 10, Budapest (HU)". BMW Motorsport. BMW. Retrieved 23 December 2009. ^ Lehbrink, Ingo (12 September 2009). "Juncadella Wins In Slippery Monza". BMW Motorsport. BMW. Retrieved 23 December 2009. ^ "Silverstone day one — Magnussen on top for McLaren". Formula1.com. 17 July 2013. Retrieved 17 July 2013. ^ "Daniel Juncadella joins Sahara Force India as a reserve driver". Sahara Force India. 24 January 2014. Archived from the original on 26 January 2014. Retrieved 25 January 2014. ^ "Daniel Juncadella". BMW Motorsport. BMW. Retrieved 23 December 2009. ^ "Mortara takes pole in Spain". gpupdate.net. GPUpdate.net. 21 May 2010. Retrieved 14 July 2011. Wikimedia Commons has media related to Daniel Juncadella. This page was last edited on 10 February 2019, at 08:17 (UTC).